Plan a getaway for you and your Valentine in the Smokies and take advantage of all the opportunities for romance that Smoky Mountain cabin rentals afford. With many excellent restaurants within a short drive, you can enjoy a special meal together before returning to your cabin or skip the crowds entirely and put together an unforgettable meal served under the stars of the Smoky Mountains with your cabin’s full-sized kitchen. Take advantage of the other features of cabin rentals in Gatlinburg, TN and soak in the hot tub or snuggle together by the fire for a date you will always remember. At the Great Escape Chalet, you can enjoy two of the more unusual features of any cabin rentals in Gatlinburg, TN. Gaze out at the national park from your jacuzzi room, which features floor-to-ceiling windows in two directions for an unforgettable soak. Close the curtains for privacy or head out onto the back deck for some time in the hot tub. Afterward, snuggle up by the fire until you are ready for bed, but leave the flames flickering and enjoy them from the other side of the two-sided fireplace in your king bed! This cabin also features a game room with a pool table to feed your competitive sides. Tuck yourselves into A Mountain Hideaway and relish its quiet woodland setting. 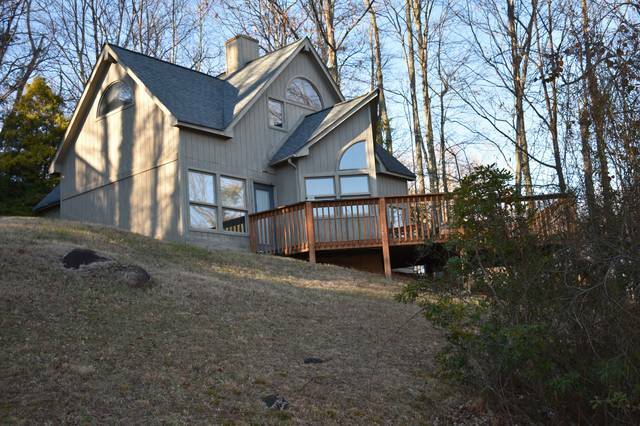 This cabin boasts breathtaking views of the Smoky Mountains and has its own private hot tub. The master bedroom has a king bed and there is a sleeper sofa if the children are coming with you. Two decks and a fireplace will beckon for relaxation and quality time spent together. Find your ultimate getaway spot at Our Shangrila, one of our newest additions. This chalet has a master bedroom with king bed, plus you can bring the kids or another couple with a second bedroom on a different floor. One of the highlights is sure to be the wood-burning fireplace set into a large stone hearth with a comfy leather couch and a pair of recliners nearby. Our Shangrila is a great choice for couples who like competition as well, with a pool table and basketball hoop. Make your home in the treeline at Owls’ Nest, a cozy A-frame chalet with views over Gatlinburg and the Smoky Mountains. Watch the sun set and the stars come out from the spacious back porch, with the lights of Gatlinburg below and the Smokies beyond. The hot tub makes for a great way to soak in the crisp mountain air. It offers access to three resort clubhouses, with a fitness center, swimming pool, and game room. Whichever of our cabin rentals in Gatlinburg, TN that you choose, you will be close to all the area attractions. Smoky Mountain cabin rentals make for a great base to explore the national park, with full kitchens to prepare a hearty breakfast and snacks or a picnic lunch. Plus, nothing takes off the miles you’ve hiked like a jacuzzi or hot tub! So, whether you enjoy fine dining or the great outdoors, book one of our cabins for you and your sweetheart now.